When you are trying to discover more about a particular subject, most people just use Google. However, and even though Google has a lot of information to provide you, sometimes, you just need a good and detailed book to explain to you everything you want to know in detail. And this is why you should consider checking out the 5 blockchain technology books we are about to show you. Trying to cut the waste of your company? While there is a lot of free information out there, this information may not be accurate all the time. In fact, you may also want to get a deeper knowledge or learn the ropes from an expert. And this is why you should consider reading some blockchain technology books. This book is a great example of a good book for blockchain lovers who are trying to discover more about blockchains. You will be able to have a new perspective on what a blockchain can do as well as on the impact it can have on the world that we live in. The authors will also explain to you how it is possible that a technology allows you to use a public network to record all your data even though this data is always maintained safe and secured. Discover the best bitcoin mining and cryptocurrency trading courses in 2018. The author of the Mastering Bitcoin: Unlocking Digital Cryptocurrencies is a known and respected figure who defends Bitcoin. While The Mastering Bitcoin: Unlocking Digital Cryptocurrencies is more about Bitcoin than about blockchains, it is important that you understand the concepts of cryptocurrencies and the ay they can act before you actually dig into blockchains and the blockchain technology. The author of the book will explain to you in detail everything about the foundations of bitcoin as well as all the details that you need to know about the security principles, the peer-to-peer architecture, the transaction lifecycle, and the decentralized network. Take a look at the best blockchain training courses in 2018. The Science of the Blockchain by Roger Wattenhofer is another great blockchain technology book that you should consider reading. The author will show you the different protocols as well as different algorithms for a blockchain but he will also unveil the practical systems that implement these techniques. This book is specifically based on the author’s knowledge of the finance system and it tries to serve as an inspiration to the Fintech professionals who are looking to understand the ropes behind this technology and to implement it. The Blockchain: Blueprint for a New Economy by Melanie Swan is probably one of the most popular books on this list and it clearly demonstrates the positive impact the use of the blockchain technology can have in a wide range of industries. We can definitely say that the author has taken this technology a bit further by presenting it as the fifth disruptive paradigm following to mainframes, personal computers, the Internet, mobile, and social networking. The truth is that as the founder of the Institute for Blockchains studies, the author has a high and deep knowledge of this technology and she can definitely express her views in a clear way. Discover how to implement blockchain technology. 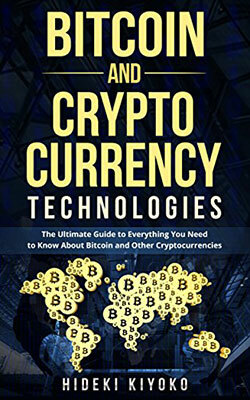 Finally, this is another book that tends to focus more on cryptocurrencies, more specifically on Bitcoin. In case you are interested in these topics, this is a great first book to get the grasp on the topics. This is the kind of book that shows you all the concepts that you need to understand in a clear way as well as on what you need to look for and understand about what can happen in a near future.